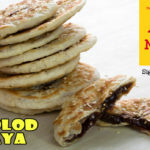 The Merzci Pasalubong biscocho is a bestselling crunchy snack here in Bacolod City and around the country. 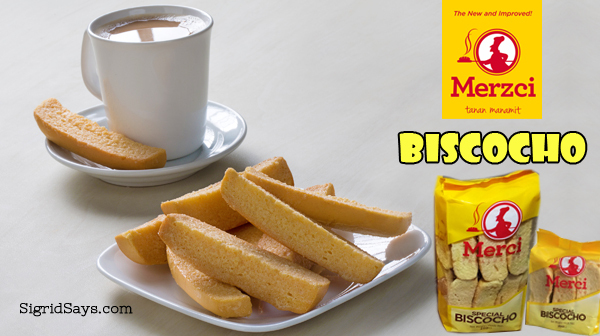 Crunchy, satisfying snack — Merzci Biscocho. 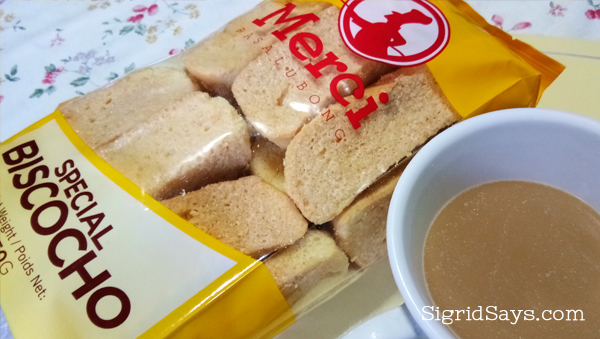 The Merzci Pasalubong Biscocho is the most bestselling Bacolod pasalubong item. It is slices of toasted yellow bread spread on one side with a milk-butter mixture and baked to a certain level of perfect crunchiness. 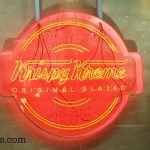 It is so good and does not easily spoil that retailers from abroad order these by the bulk to resell in the United States, Canada, and even the Middle East. Plus, it is a favorite pasalubong item from Merzci because it is presentable, affordable, and lasts long, too. 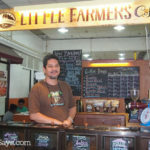 Here in Bacolod, it is one of the preferred snacks of locals. We regularly have them in the house. My parents, too, love them. But they eat this differently and have actually mastered it. They dunk their Merzci Biscocho in piping hot coffee. They said it does not work with cold drinks. The butter spread does not allow the cold liquid to seep through. But when it’s very hot coffee, the biscocho is soaked in coffee and it’s so good with every bite. hahaha And they have such observations about their Merzci Biscocho. My parents dunk their biscocho in their coffee. They say it’s so good that way. Additionally, some people buy biscocho for their kids to eat. 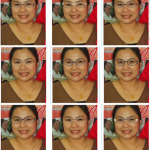 They are great pambaon in school and also as a teething aid for toddlers. They get to eat something good plus it helps work out their gums. Yeah, a good snack and each family has their own story to tell about the Merzci Biscocho. 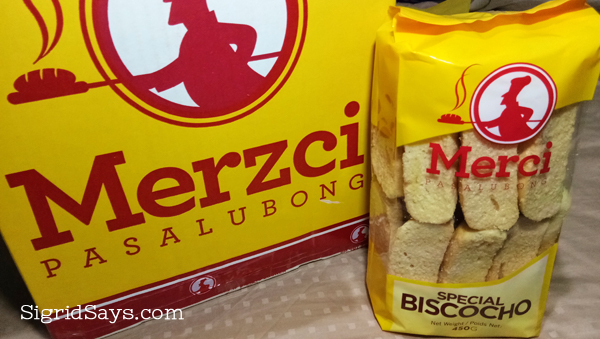 Merzci Biscocho comes in big and small packs, so you have two pasalubong choices. When you visit Bacolod for the MassKara Festival, don’t forget to bring home Merzci Biscocho and other very good food stuff from this store. 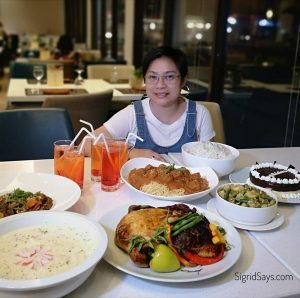 They have so many branches around the city, including one at the pre-departure of the Bacolod-Silay Airport and at the BREDCO port. Make sure that your box of Merzci Pasalubong has a bag or two of Merzci Biscocho. 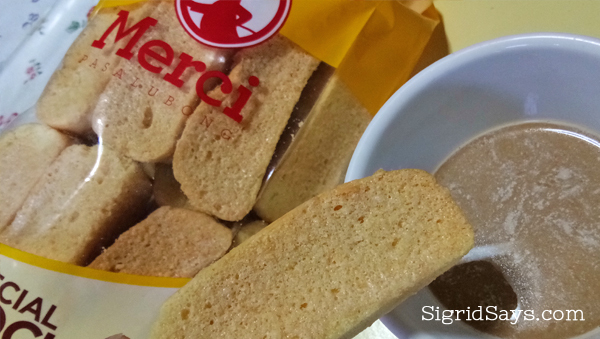 Have Merzci Biscocho with your coffee.